Is one of our favorite Mazda cars finally returning? Ever since Mazda revealed the stunning RX-Vision Concept, enthusiasts have been . While we certainly wouldn't say no to a new rotary-powered sports car from Mazda, we had our sights set on something a bit more reasonable. A few years ago, we , the MX-6, instead of a new RX model. Now, that Mazda has filed a for the ‘Mazda MX-6’ name to be used on “automobiles and parts and accessories thereof.” You can't even imagine how happy we are right now. If you are one of our younger readers and can't understand our excitement over the possible return of the MX-6, simply watch the video we included above and listen to the car's exhaust sound. The Mazda MX-6 was sold in two generations from 1987 to 1992 and from 1991 to 1997 (with a small overlap between the two). The first generation model was rather forgettable but did feature some interesting turbocharged engine options and four-wheel steering on GT models. The second generation MX-6 shared a platform with the Ford Probe, so it was a front-wheel-drive car. While its drivetrain and platform weren't inspiring, it was sold with 2.0- and 2.5-liter V6 engines. The most powerful US-spec car only produced 164 horsepower but it still sounded incredible (especially with an aftermarket exhaust). JDM variants even produced as much as 199 hp thanks to different cams, pistons, intake manifold, and compression. 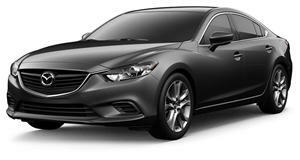 Mazda filed for the trademark with the JPO on October 16, 2018. The filing alone is still very little to go off of but it does give us a glimmer of hope for the MX-6's return. Of course, a new MX-6 wouldn't have the same small displacement V6 as before, though it could adopt Mazda's new SkyActiv-X engine or even an electric powertrain. Either way, we are praying for the MX-6's return because a two-door sports coupe with Mazda's Kodo design language would be spectacular.